I absolutely love this time of year because neons and bright polish are making a resurgence. 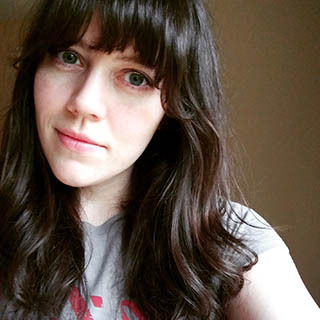 Today's post features Morgan Taylor's Selfie Collection and it's packed with everything bright and fun. Notes: This soft pink is the most tame shade in this collection. You know what? I kind of like that. It may stand out for being different, but I'm willing to bet this pink looks amazing on all skin tones. 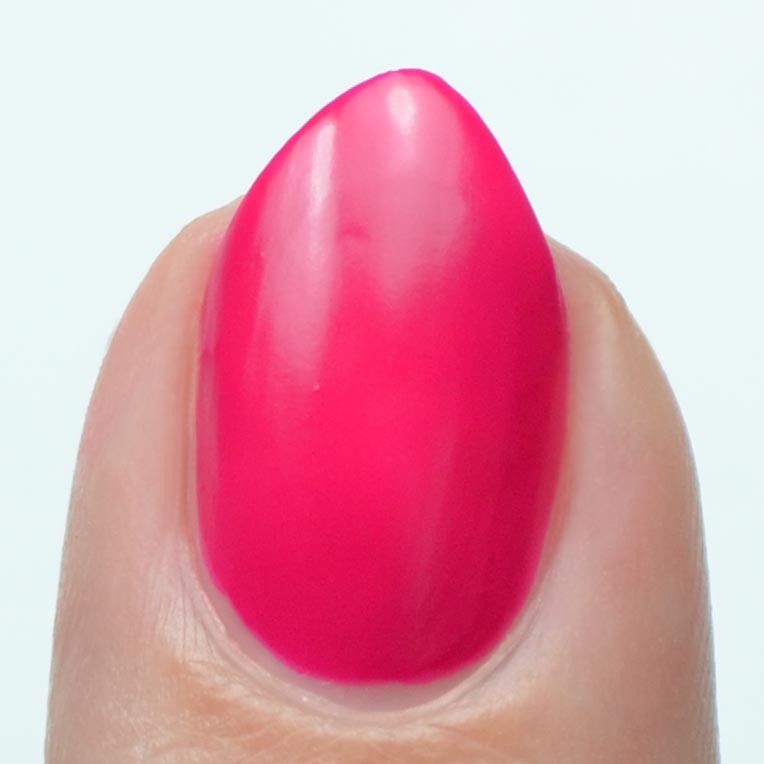 Notes: This shade is just neon enough that it gives me the illusion of a tan. If you look closely you can see the pretty flecks of shimmer. Notes: Of all the shades in the Selfie collection I think this might be my favorite. It's delightfully loud and perfect for summer! Notes: This shade does show a little bit of visible nail line under daylight bulbs, but I think a third coat would be enough to resolve that. I didn't notice it while photographing, but you can see it in a couple of the photos. Notes: This neon blue makes me think of white sand and tropical beaches. It gets bonus points because I didn't have any staining with this shade. 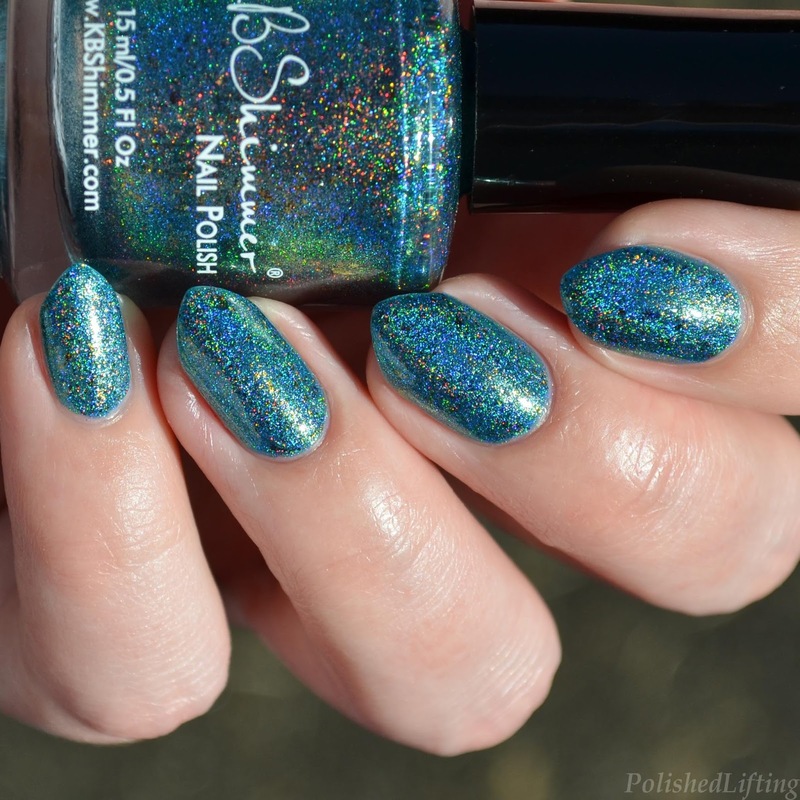 Notes: We need to talk about this crazy blue shimmer! I love how it contrasts with the neon purple. 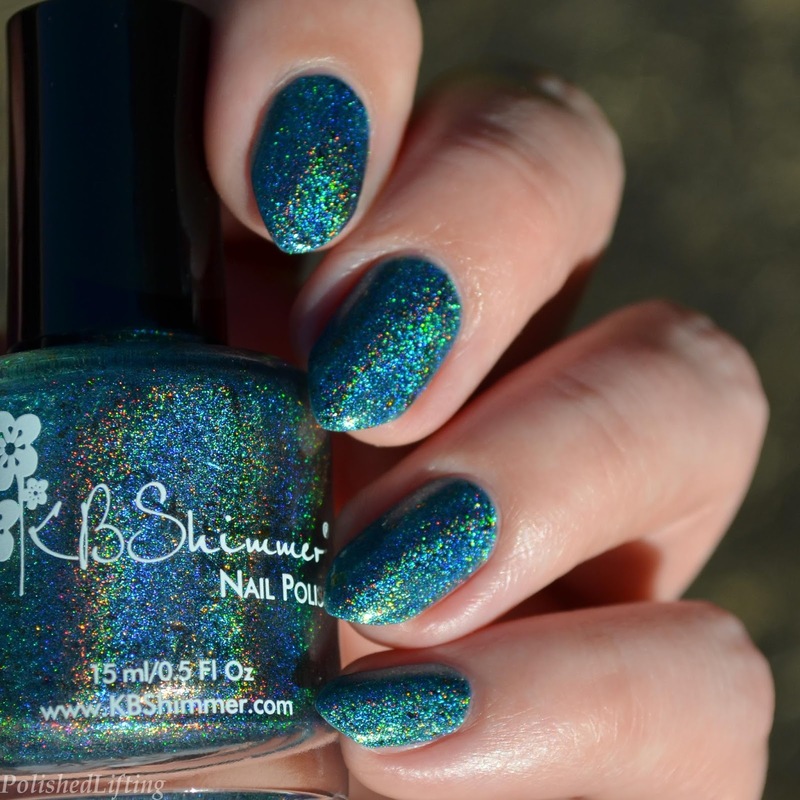 If only we could get Morgan Taylor to release a whole collection of shimmers. The Morgan Taylor Selfie collection is currently available online and at participating Ulta stores. If you enjoyed this post you might like Pink Skulls featuring Morgan Taylor and Morgan Taylor Designer Plates - Geometric 1. It's feeling like summer here in the Pacific Northwest, so I thought it would be a great time for a summer inspired dotticure. I can't think of two colors that make me think of summer more than a bright teal and coral. Dotticures aren't normally my thing because I struggle with freehand nail art, but I felt the urge to give it another try. I found that using a smaller dotting tool and using less polish on the tool gives me more control over the shape and size of the dots. I'm quite happy with the improvement. For an extra bit of fun, I added Baroness X Fire Opal as a topper over everything before adding dots. It's a bit subtle on camera, but the effect was as prominent as it looks in the final low-light photo. If you enjoyed this post you might like Neon Roses featuring JulieG & Baroness X and Baroness X Minthe | March 2017 Monthly Mythical Mysteries. Woohoo! And with this post I am *finally* back on track with the #clairestelle8may challenge. 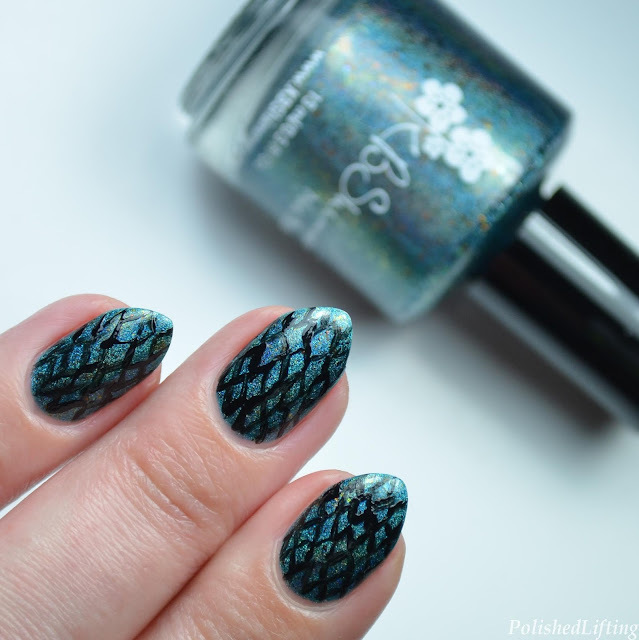 Today's post is themed Halloween in May, and features two new shades from Morgan Taylor's Selfie collection. While I absolutely love Halloween, I thought I would glam it up a bit since we are in May. 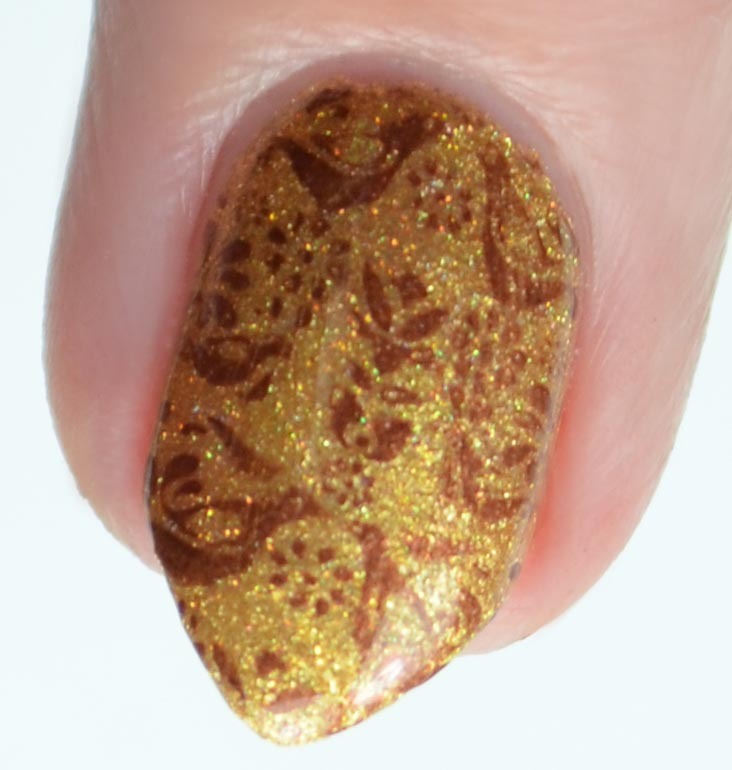 I don't know if you guys remember my review of the Morgan Taylor Celebrations 1 Designer Plates, but I promised that there would be more manis using those images. This challenge prompt was a perfect opportunity to bust out some Halloween themed stamping outside of October. 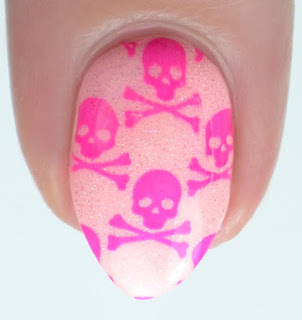 I mean, you can't really argue with the fact that pink skulls are totally cute in a badass kind of way. 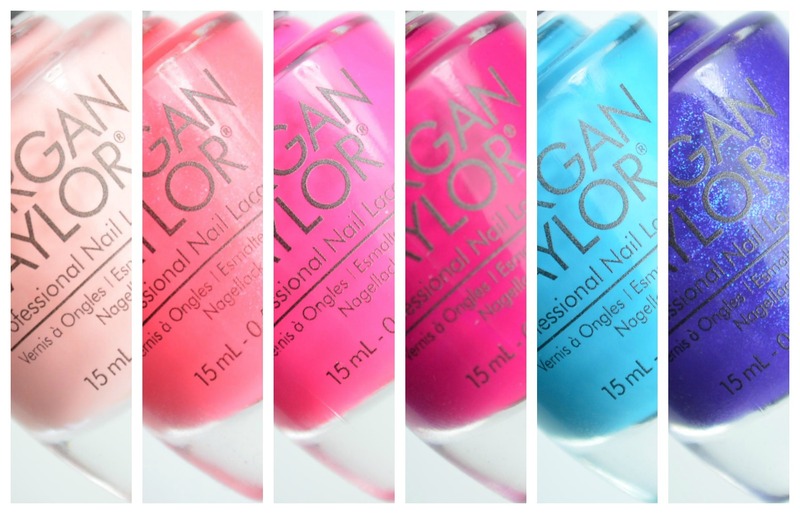 Stay tuned for swatches of the Morgan Taylor Selfie Collection coming soon! If you enjoyed this post you might like Morgan Taylor Designer Plates - Geometric 1 and Morgan Taylor Beauty and the Beast Collection. I'm still playing catch up with the #clairestelle8may challenge, so today's post is my take on the "antique" prompt. It's a total cop out, but after half a month of trying to come up with a design I still didn't have any ideas. 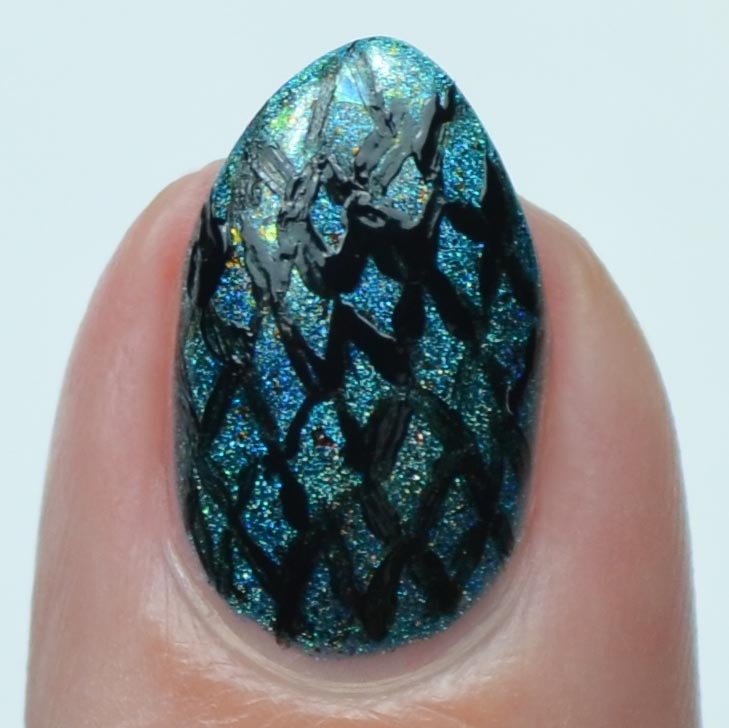 I actually dug into my backlog of nail art photos to see if I could find something suiting. I decided to go with this 60's/70's vintage print nails as they are the most "antique" print I own. 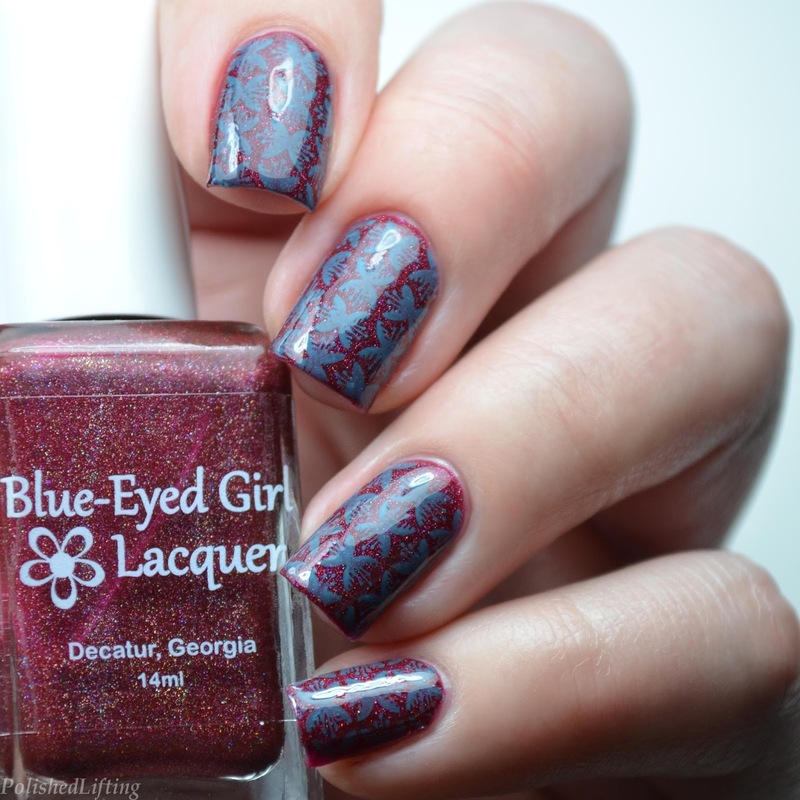 This look features an absolutely stunning red from Blue-Eyed Girl Lacquer and a floral print plate from MoYou London. There's something just perfect about red and robins egg blue when you pair them together. It's one of the more oddball color pairings that I always gravitate toward. 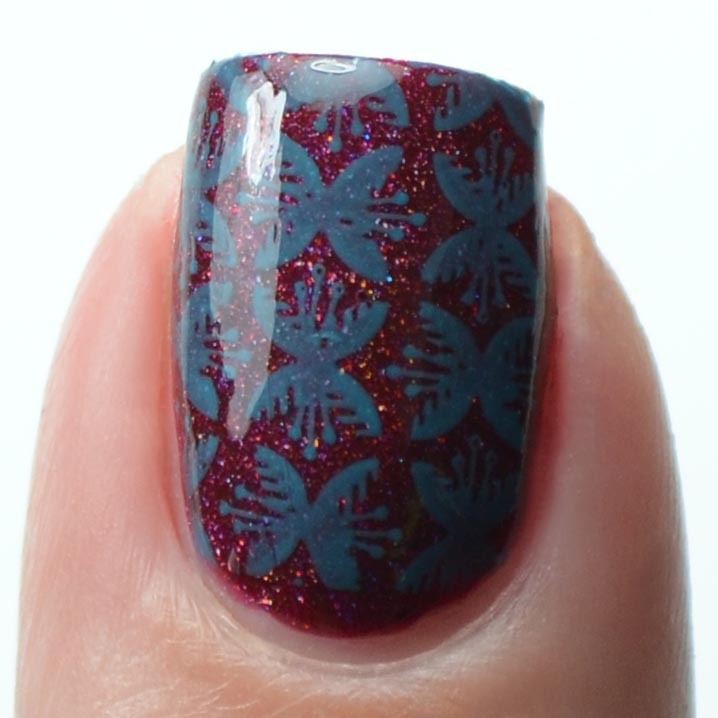 If you enjoyed this post you might like Hydrangea Stamping featuring Born Pretty Store and Blue-Eyed Girl Lacquer Atlanta Indie Shop Exclusive, Siren's Fever Dream & Flaming Fields. Oh hey there! I know it's been a hot second (more like a week) since you've seen something new from me. While I had a handful of manis planned out for this week, I didn't have time to do the write-ups until now. It's been a busier than usual week meeting up with family and friends for various occasions. 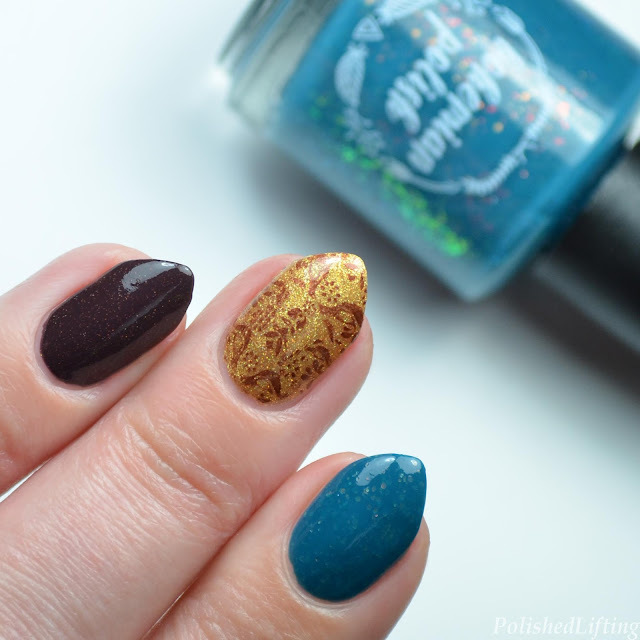 I'm finally back with a ton of new manis to share with you! Today's post features my Vintage Pyrex look I created for the #clairestelle8may challenge prompt of Mother's Day. That was supposed to be posted last Saturday... As you can see I'm a smidge behind. 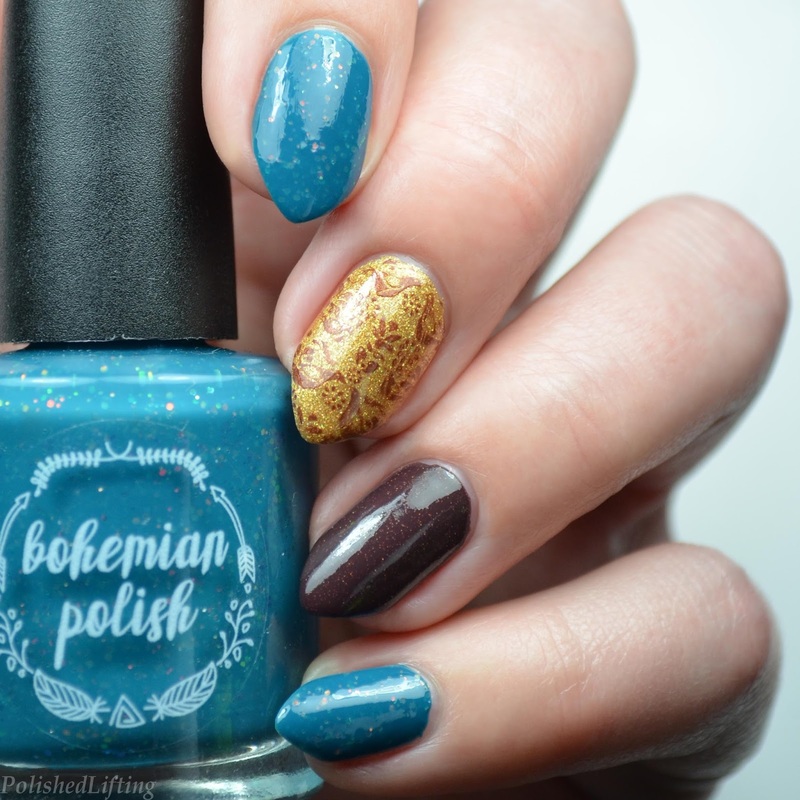 This look uses shades from Bohemian Polish's Baltimore Rainbow collection. I actually planned this mani (minus the stamping) as I was unboxing all of these shades. Every once in a while my mind gets ahead of me and it can take a few weeks to see looks come to fruition. 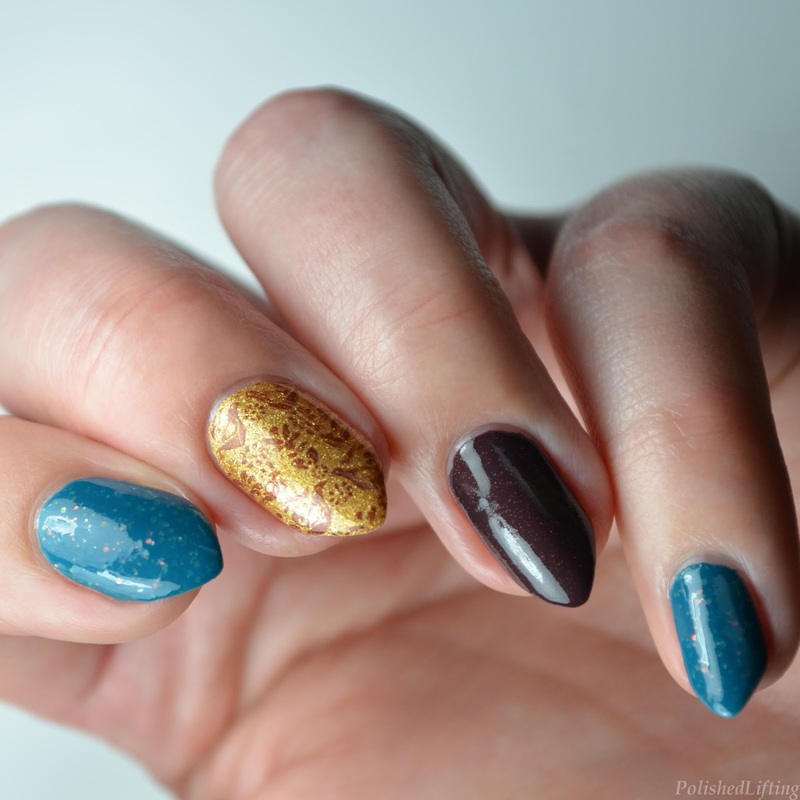 I love doing vintage with a modern twist, so this was a fun mani to plan out. I can't wait to come up with more vintage looks! I don't know what has gotten into me recently, but I've really been into layering things. It often starts with a creme base, and no intention of doing anything more than just wearing a creme. Within an hour of finishing my creme mani I decide that it's not complete, so I dig through my helmers for something to add to it. Today's mani is a result of one of those days. For this look I started with a base of JulieG Cabana Boy. 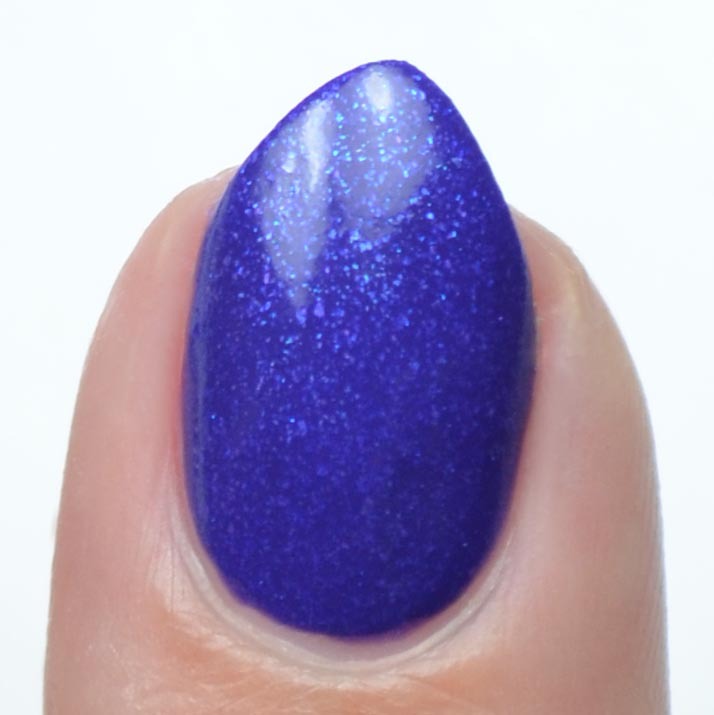 I adore this blue, but I found myself wondering what it would look like if I added a contrasting shimmer on top. After a couple of color tests I decided to go with Baroness X Rubi as my topper. I was satisfied with how this turned out... at least I thought I was. 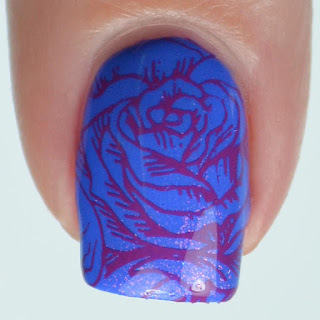 About thirty minutes later I found myself going through stamping plates to add a final touch. After some contemplation I decided to use this pretty, detailed rose stamp from UberChic Beauty 4-01. I'm happy to say that I finally settled down after all of those modifications! 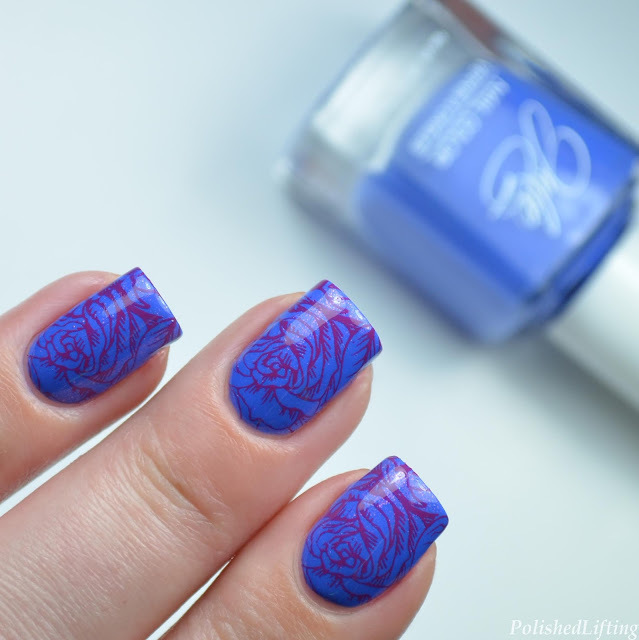 If you enjoyed this post you might like Floral Stamping with Zoya Elodie and UberChic Beauty and Red Dahlia Nail Art featuring Bliss Polish. Hey guys! I'm back with a swatch and review of KBShimmer Steal the One and some dragon scale nail art for the nail art challenge I'm participating in this month. I'm ashamed to admit that this beautiful polish has been sitting in my untrieds for nearly a year, but I'm glad I'm finally able to share it with you all. Notes: I very rarely have time to wear polish for more than a day, but I made a point of wearing this for a few days because of how much I love it. It's stunning in all different types of lighting. We finally got some sun out in gloomy Oregon, so I took a gratuitous blurry holo shot in addition to a focused one. 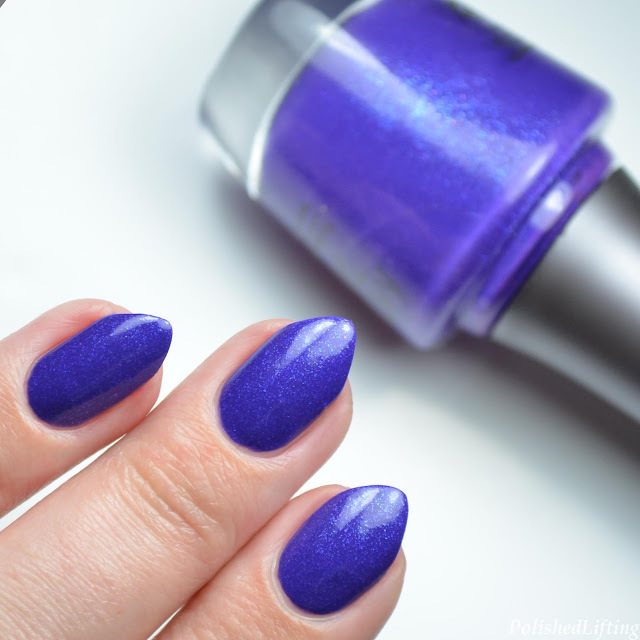 This shade is so dang pretty! This shade was originally from The Color Box: Teal (June 2016), which is no longer available. My decision to wear KBShimmer Steal the One wasn't just decided because we have sunshine. 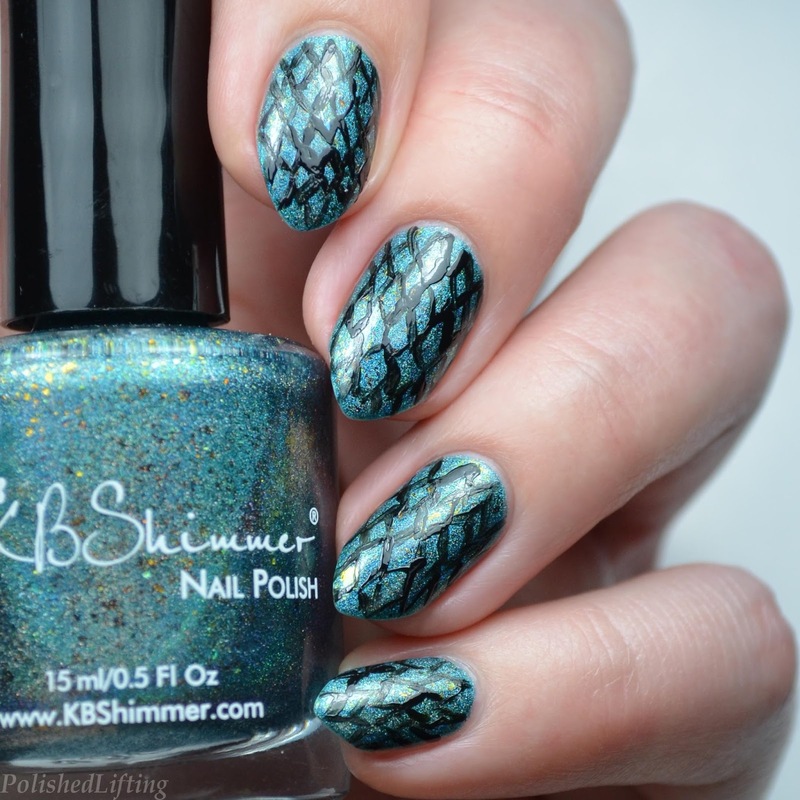 I thought this sparkly teal would make a great base for dragon scale nail art. I've never been particularly good at freehand nail art, but I like to give it a try occasionally. I think with a bit more practice I will have these down. KBShimmer Steal the One is not available for purchase on her website, but she has a ton of gorgeous shades to choose from. You can see all of the current shades by clicking the shop link below. 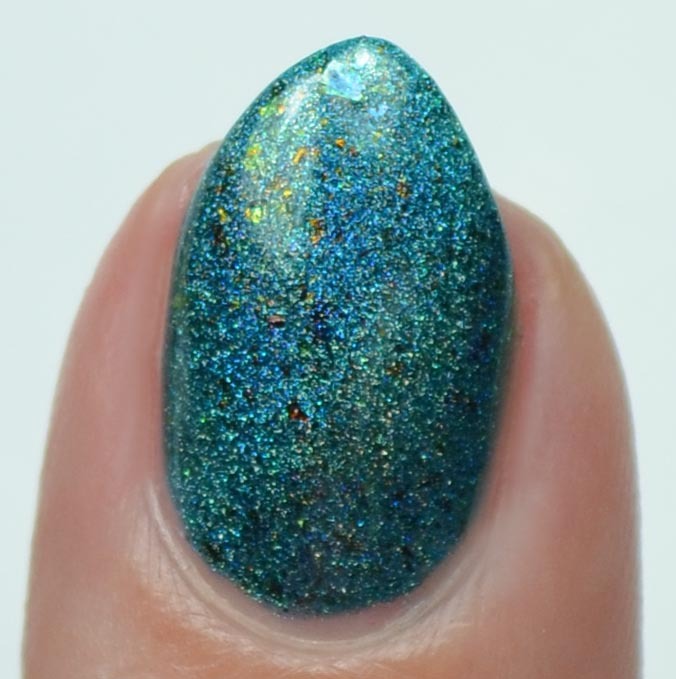 If you enjoyed this post you might like KBShimmer Take Me For Granite and KBShimmer Spruce Things Up.